I am about to replace the rear struts can you send me pictures showing how to remove and replace the rear struts? I have attached an exploded view of the rear strut assembly. However, I am concerned. 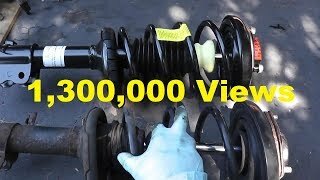 Do you have the proper tools to replace the strut? Trying to remove a coil assembly from the unit can be dangerous if you don't have the right tools. 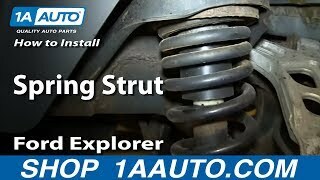 I am replacing the strut with coil assembly. 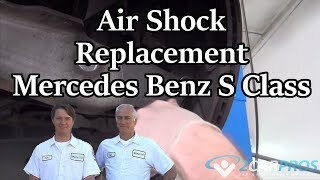 I am replacing the strut coil assembly do I have to go under the back seat or in the trunk to remove the nuts from the upper part of the strut? Yes, the rear seat needs removed. Additionally, you will need to separate the stabilizer link assembly, abs sensor, and rear brake flex hose (attached to the bottom of the strut assembly). 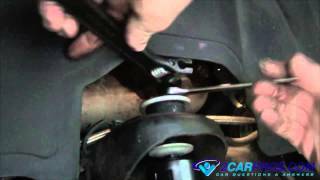 From that point, you will need to unbolt the assembly from the vehicle and remove it. PLEASE properly support the vehicle. I don't know how to remove the rear seat can you send me instruction or pictures? I would be happy to help, but there are several different options. I have attached pics for you for the different types of seat options. Let me know if the help. The first picture options do I lift up the front part of the seat and pull what to do there? Place your hands near the hook, as shown in the illustration, and lift the seat cushion to detach the hook. Let me know if you get it. I tried to lift the front of the seat but it didn't move feel like something is holding it. There are clips that hold it in place. Don't go crazy, but don't be afraid to pull on it to remove it.